ANN ARBOR – The Desai Accelerator, a joint venture between the University of Michigan’s Ross School of Business and the College of Engineering, has selected six teams into its Summer 2018 cohort and debuted an expanded intern program to support those startups in their development. The Desai Accelerator, managed by the Ross School’s Samuel Zell & Robert H. Lurie Institute for Entrepreneurial Studies and the College of Engineering’s Center for Entrepreneurship, nurtures ventures as they reach the critical phase between early-stage development and the point at which they seek external investors. The accelerator provides each company with a $25,000 investment, support from mentors and access to University of Michigan interns, as well as office space in downtown Ann Arbor. The companies will showcase their progress at Desai’s Demo Day event on September 12, where they will pitch their businesses to active investors. Canopy, a web application that helps families and individuals talk about and make end-of-life healthcare decisions and share those decisions with others through an advanced care directive, supporting both individuals and healthcare systems through advance care planning services and legal documentation. Mi Padrino, an online application that makes the planning and paying for Hispanic events, such as quinceañeras, weddings and baptisms, easy and effective. Mi Padrino offers planning resources, personal event pages and crowdfunding features tailored to the Hispanic community — a population that has been underserved until now. Movatic, a software platform that makes mobility hardware shareable. On the Movatic app, users can find, rent and pay for different mobility services — and the app’s back-end allows for these services to be managed, pricing to be set, hardware to be maintained and customers to be supported. These six companies were chosen from a pool of technology-focused applicants from six countries and 10 different states: about 33 percent had female founders, 45 percent were from states other than Michigan, and 60 percent had founders from outside of the University of Michigan. This summer’s program will also expand intern and mentor support available to the accepted entrepreneurs over the 16 weeks of the program. Entrepreneurs will now be able to tap a staff of 10 interns, up from six in previous cohorts, who execute tech, business and design projects during the course of the accelerator program. Additionally, entrepreneurs will benefit from the expertise of consistent meetings with lead mentors, and additional support from industry and skills experts that will help guide the entrepreneurs through developing their businesses. 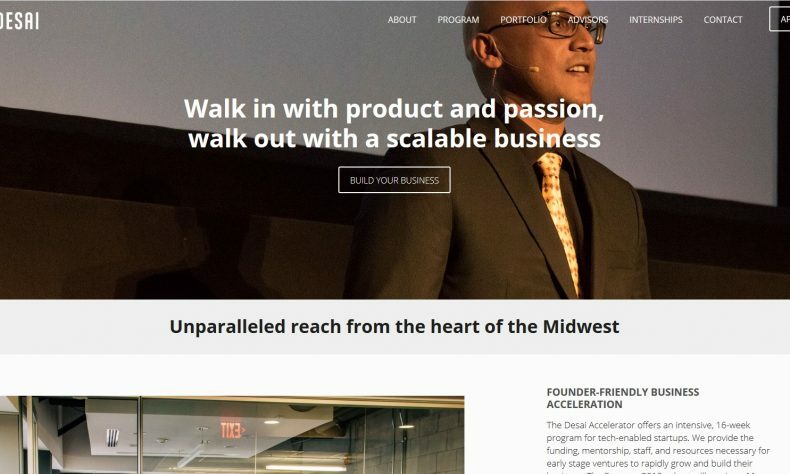 Since its launch in 2015, funding and support for the accelerator has been provided by the Desai Sethi Family Foundation, the Davidson Foundation, the Wadhams family and the Michigan Economic Development Corp. Alumni companies include Ash and Erie, which won an investment from Mark Cuban after appearing on “Shark Tank;” Gwydion, which recently closed its first seed round; MySwimPro, named 2016 Apple Watch App of the Year; and Companion, which was featured on Apple’s “Planet of the Apps” and received a $1 million investment from Lightspeed Venture Partners. Applications for the 2019 cohort will open in December. Visit http://desaiaccelerator.umich.edu/ for more information.